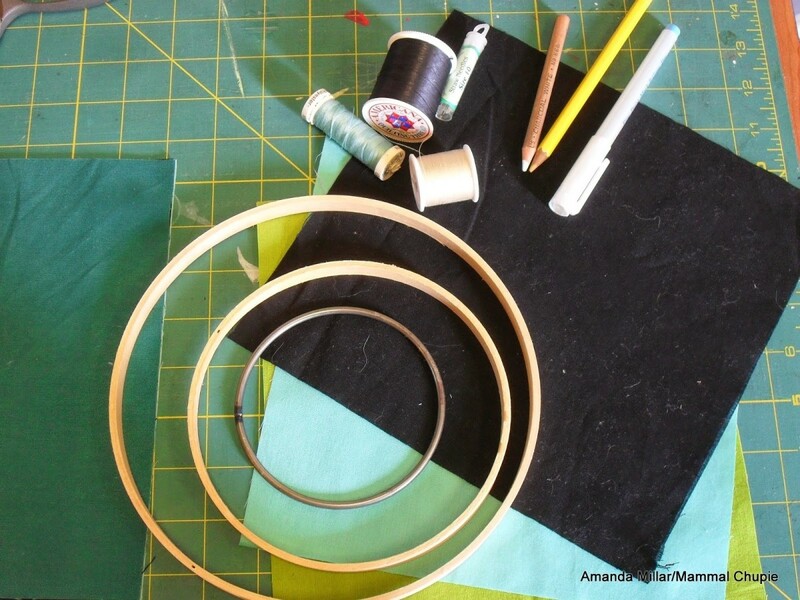 It’s my turn to share a tutorial during the awesome tutorial week of the 2014 Q1 Finish Along! What is a ‘Mola’ you ask? 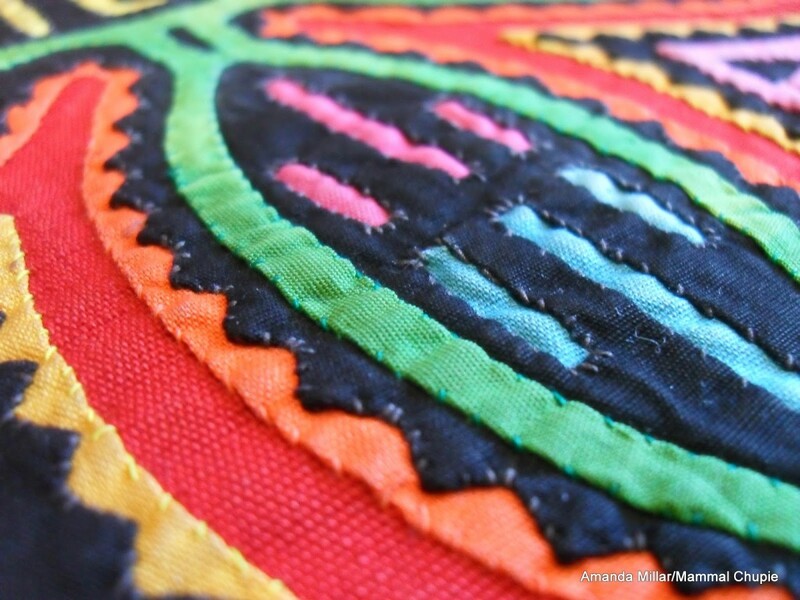 A “Mola” panel (usually in pairs, front and back) makes up part of the traditional dress of the Kuna women of San Blas Panama and means ‘shirt’ or ‘clothing’ in their native language. They are hand made using a reverse applique method, which I’ll explain in detail below. It also happens to be the name of this amazing fish, a ‘Mola Mola’ or ‘Sunfish’ which has nothing to do with this tutorial other than to help you visually differentiate between the two. 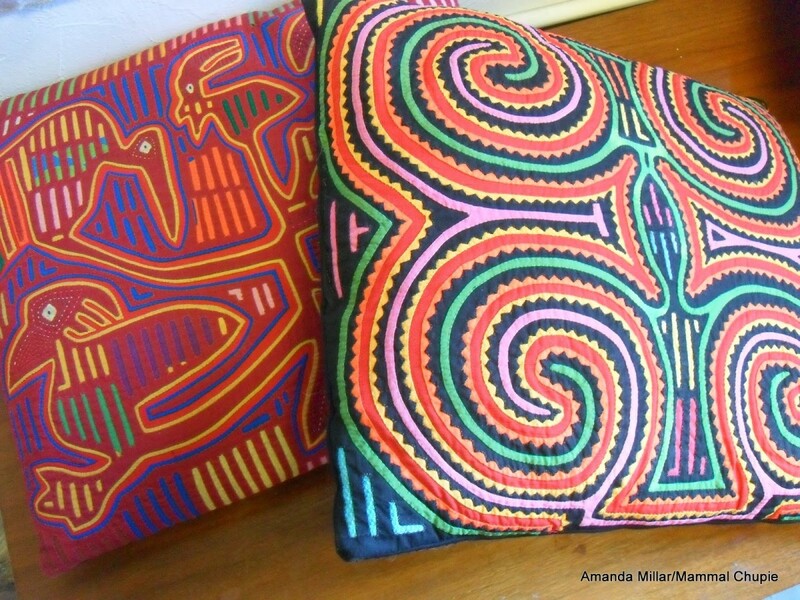 And these are my fabulous pillows made from traditional Mola panels (normally the front and back of a blouse) that my mother found while thrifting, which sparked my idea to write up a tutorial! The Kuna women are extremely skilled and have developed a beautiful method of layering several pieces of richly colored fabrics and cutting away a design to stitch down often without the aid of templates or drawings. They use very thin needles, turning under the edges slowly and make almost invisible tiny stitches tacking down the outlines and revealing new colors below. Check it out! Now, don’t be intimidated! It is really easy! I promise! I’ve drawn up a simple little project that is loaded with possibilities for making it your own, so I hope you’ll join me and make a uniquely you “mola” style reverse applique! Decide in which order to layer your fabric squares, (traditional molas were usually made with black or red at the top layer) I’m using black as the top, with the green as the base and blue in between. Once you’ve determined which square will be the top, trace your circles, one inside the other leaving a generous 1/2 inch between each drawn line. 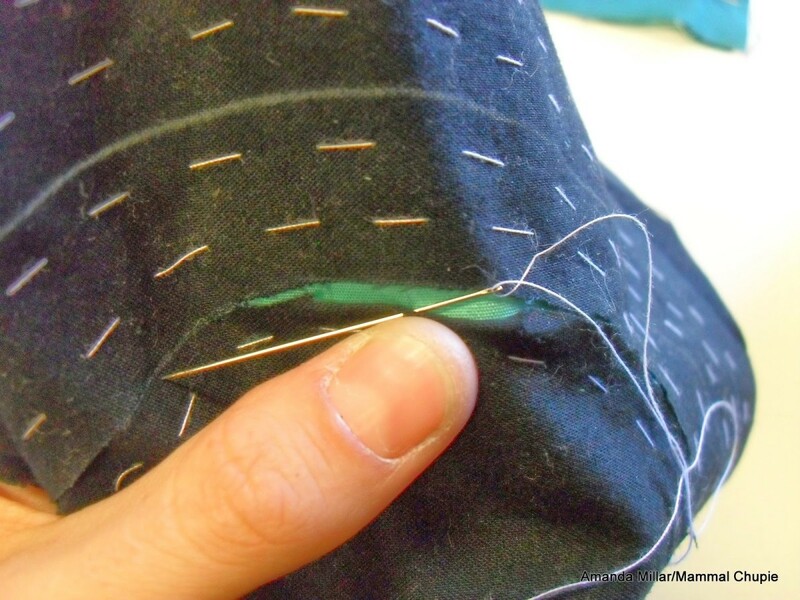 Using your white thread, baste all three layers together with a running stitch, at least 1/4 in. from either side of each drawn line. Knot these basting stitches on top easier removal later. 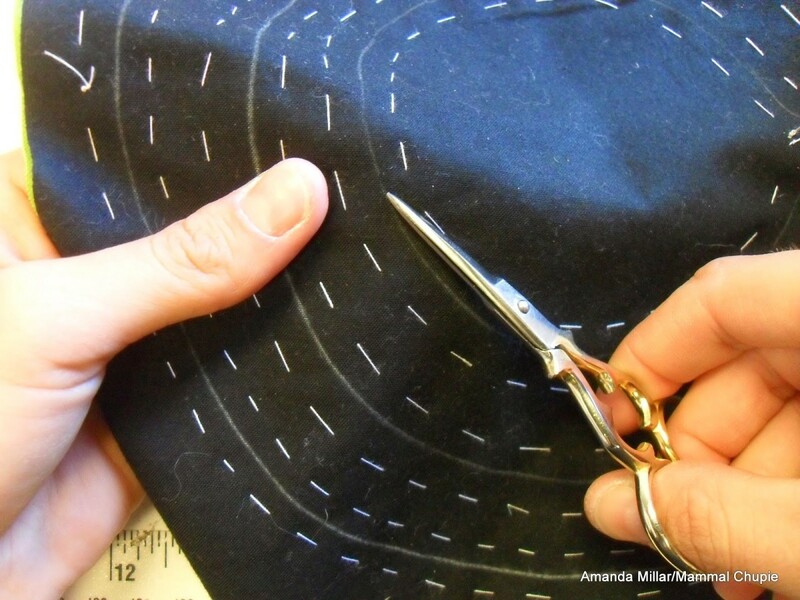 Once all the drawn lines have been basted, use sharp pointed scissors and gently poke into the top layer of fabric only, cutting along your drawn line. 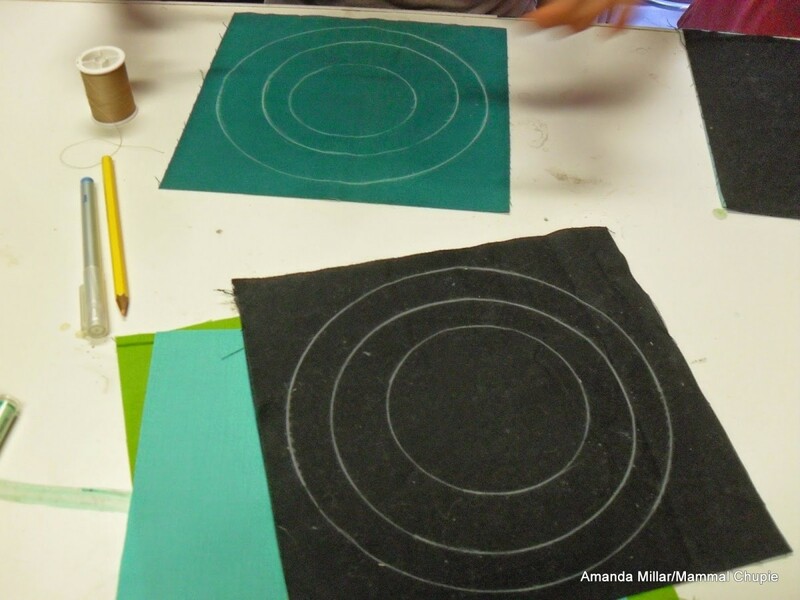 I started with the innermost circle first and chose to not pre-cut all my drawn lines at this stage to help preserve the stability of the top layer. To be able to turn under a rounded edge smoothly, you’ll need to make notches about every 1/4 inch. 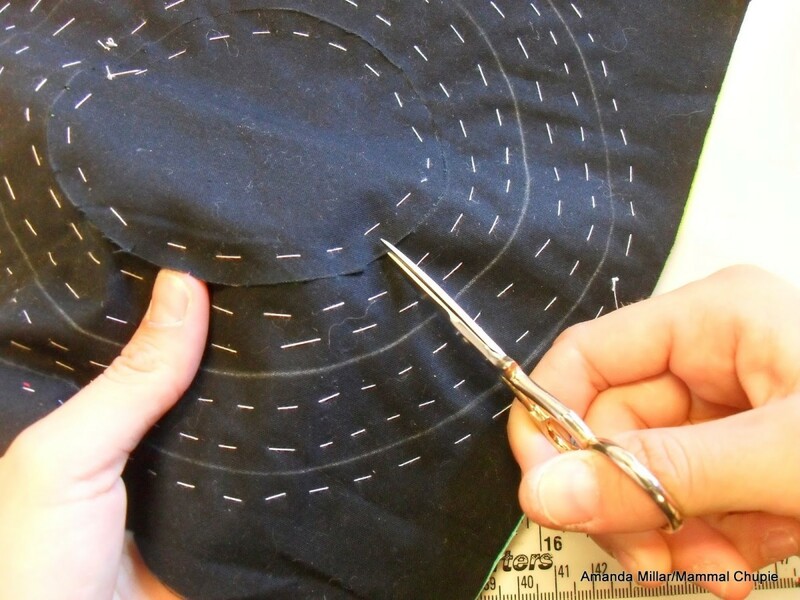 But be careful not to cut all the way to the basting stitches! This will ensure your turned edge remains smooth. Knot one end of a coordinating thread and nest it in the fold crease you’ve made. 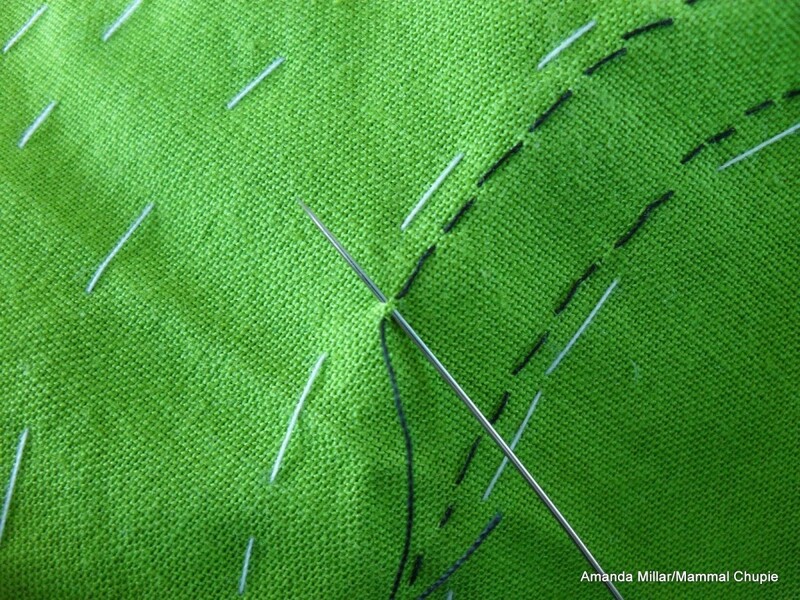 Enter the needle into the next layer in line with where you’ve come out from, go through all layers and up through the folded under edge. 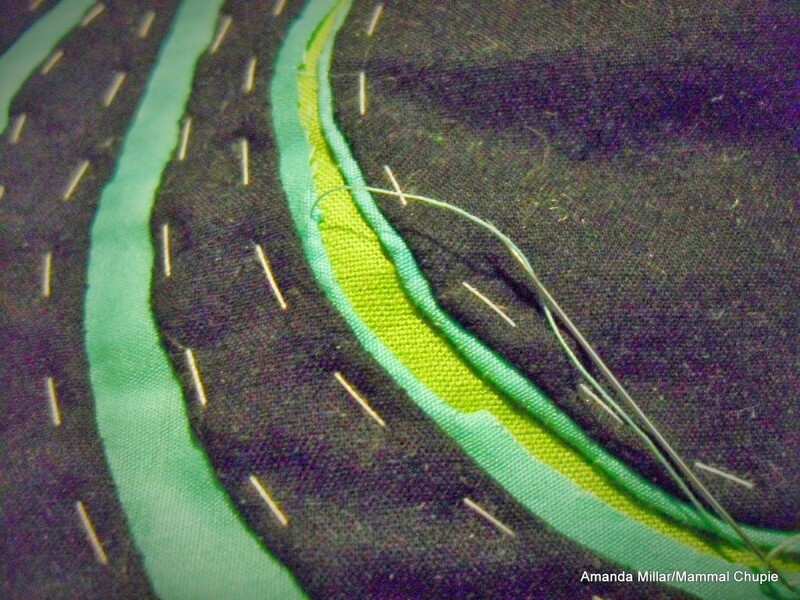 I use the thumb of my left hand (non-sewing hand) to hold the edge folded under. 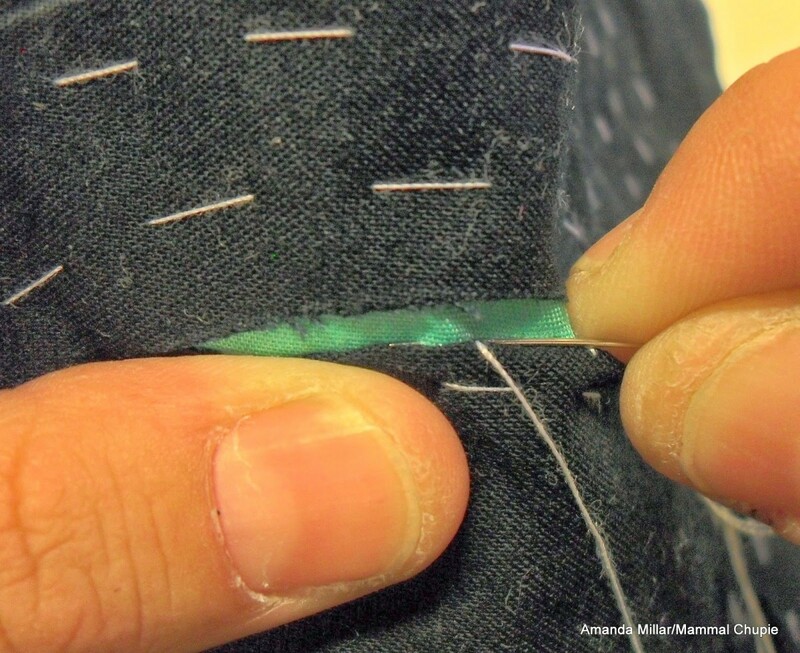 Make your stitches 1/8 in. – 1/4 in. apart to avoid points in your circle edge. 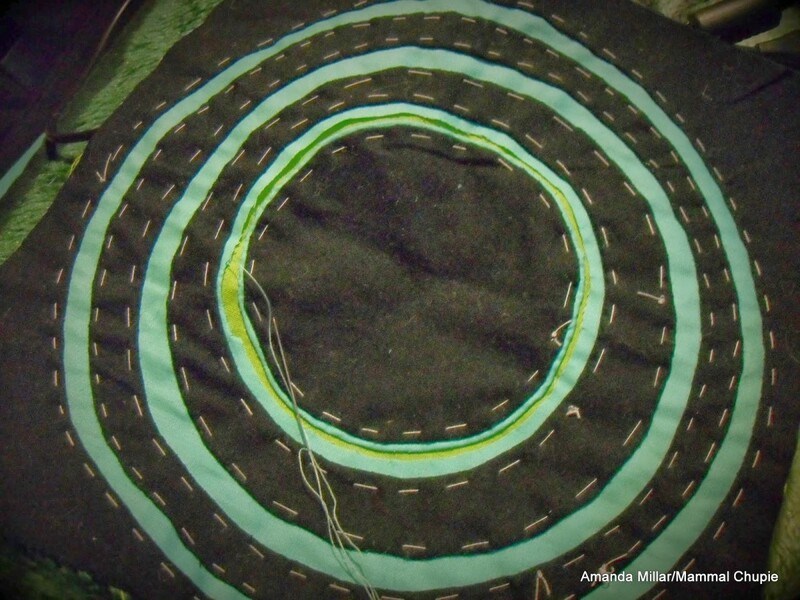 Now continue around the circle slowly and when you get close to the end of your thread, pull your thread to the back, slip the needle under a few threads and knot. 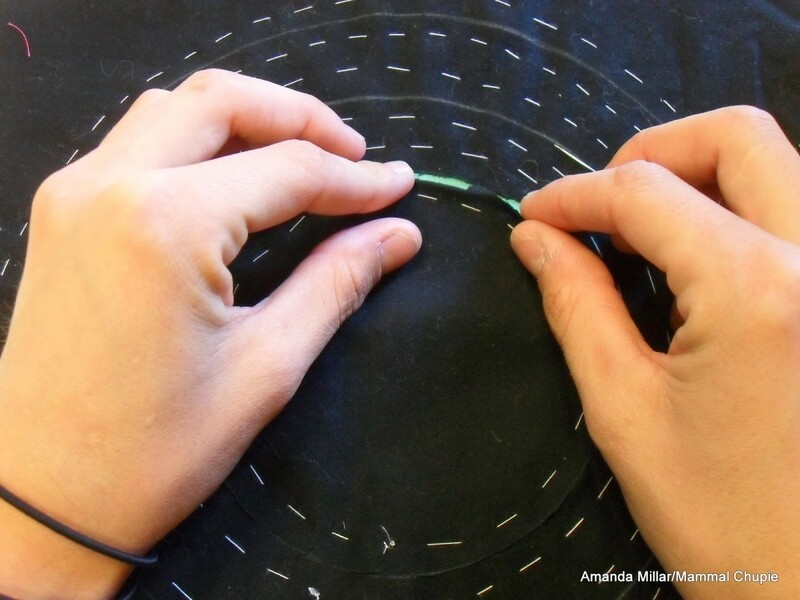 When you’ve finished with the inner circle edge, start again on the opposite side, repeating the steps of notching the circle, folding under the edge and burying your knotted thread end in the crease. 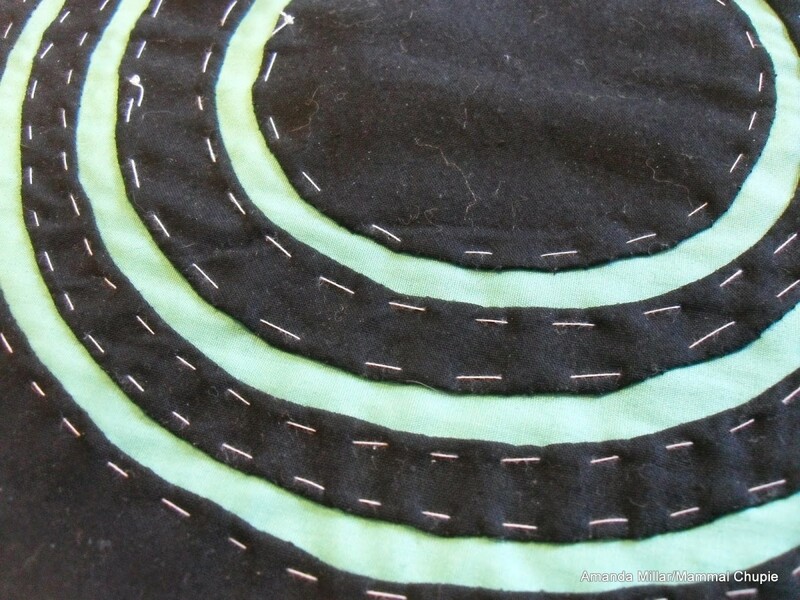 And when you’ve finished stitching down all the edges of the cut lines, it’ll look like this! 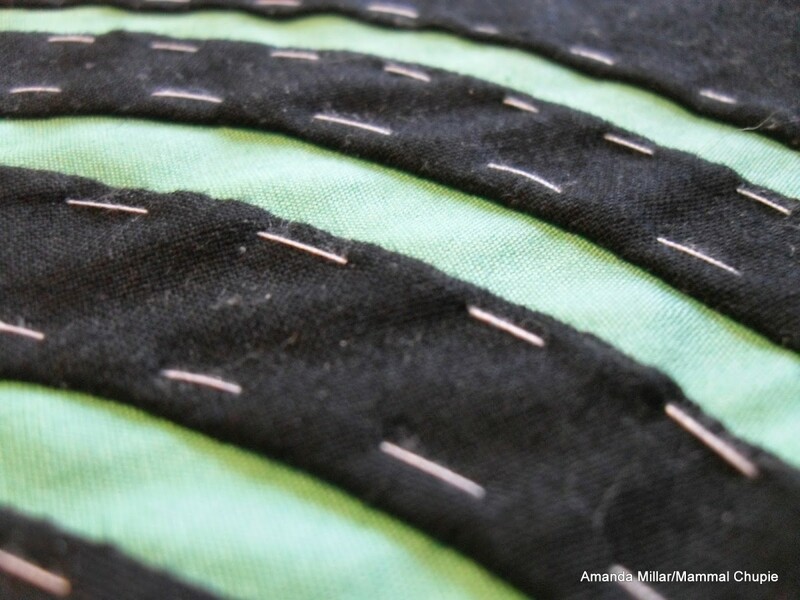 Essentially you’ll be repeating those steps I gave you for the next layer, cutting down the center of the revealed layer using caution to not cut through more than a single layer at a time, notch, fold under and stitch down. This is a very simple pattern I’ve used as an example which can be infinitely altered, varying the circle widths, inner rings, edge patterns etc. You can really use this technique with any design! 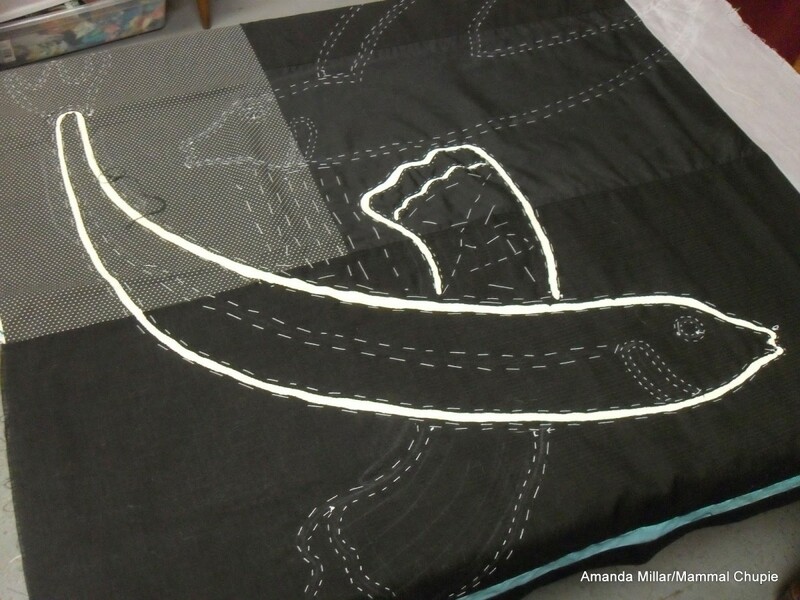 You might remember one of my 2014 Finish Along list projects that I’ve been working on recently is also a reverse applique, Flying Fish. 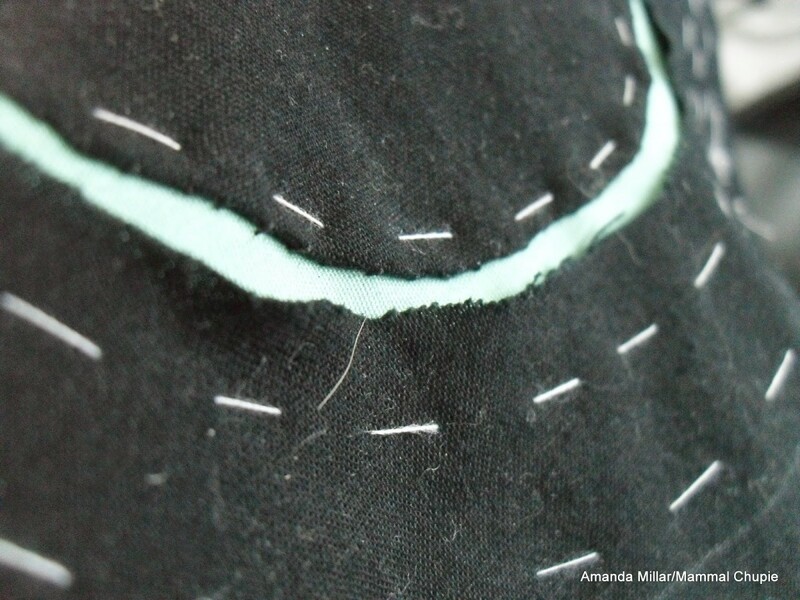 This tutorial is my technique and by no means the only way of doing reverse applique. There are many amazing quilt artists who use reverse appliques in their quilts with absolutely beautiful results. Please look over my ‘Mola Inspiration‘ board on Pinterest to ignite your creativity! It is a lot of work, but it's so worth it! I feel like it's comparable to english paper piecing, tiny whipstitches! I actually am familiar with Mola, a long time ago my mom came across several Mola blocks in the shape of animals and I was always so intrigued by them…I wonder what happened to those blocks? I never knew how it was done and now I do! Thank you! I love these, thanks for taking the time to write such a great tutorial. I've seen a sunfish in an aquarium, they're amazing to watch. This is a really cool technique, especially for us fans of hand work. Thanks for sharing! If you do any hand work regularly, this is really easy and goes by much faster than it looks like it would. Thanks so much for sharing that! I'm truly inspired to keep working on my Mola's! Great tutorial. I have a few Mola's from the San Blas Islands. I don't think I'll be making any. I'll just go on another cruise. Yes, please try it! Even if you do just a simple shape, it'll open the door to all kinds of creative ideas incorporating this technique! Wow, well not sure it would be easy for me but it does look great. Thanks for the tutorial. Mola is something I've been meaning to try for a while – I'll have to bump it up my list! Thanks for a great tutorial! Try it! Try it! I'm currently exploring ideas of writing up a Mola-a-long for my blog! 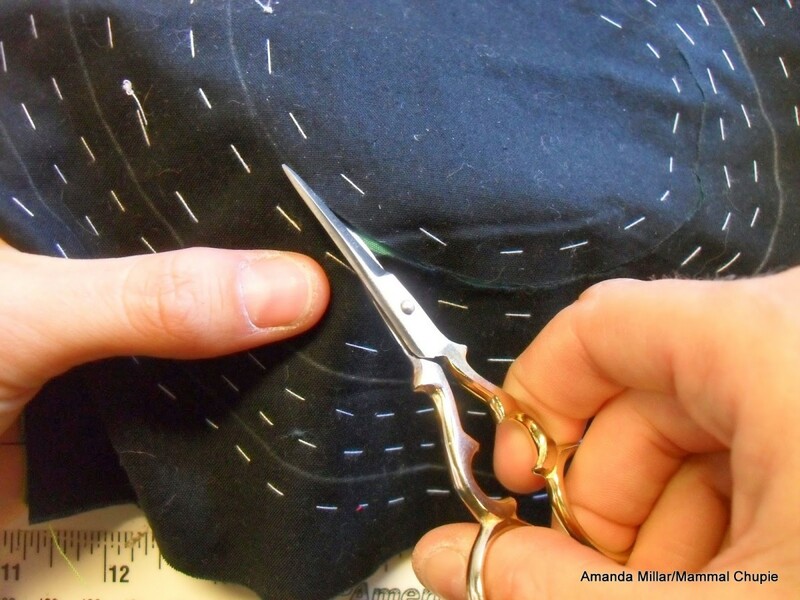 I think everyone who enjoys hand sewing will love this! Really interesting technique and it looks so effective. This looks like a great project for sitting outside in the summer under the gazebo just chatting or listening to the wind. 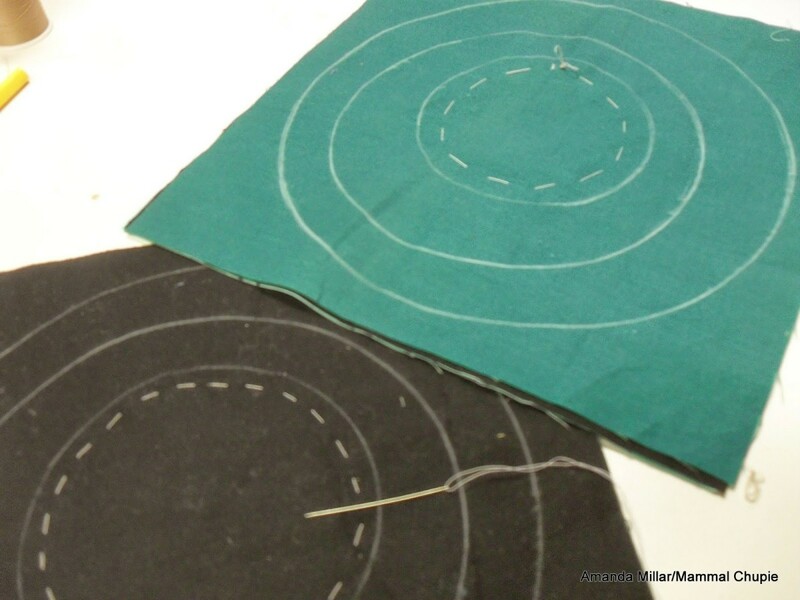 I've tried some at a class but we cheated and used felt so didn't have to do the turning under!! !